CKEditor Drag and Drop Image Upload - vBulletin Mods That Rock! 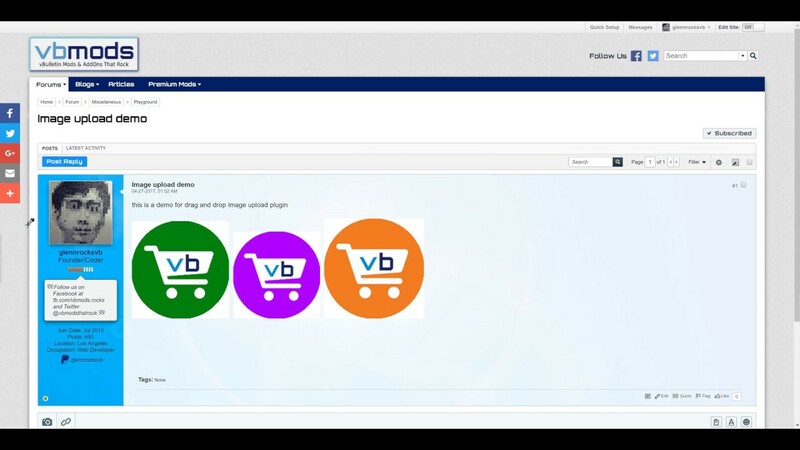 This vBulletin 5 plugin allows drag and drop image upload into the editor making it super easy and convenient for users to attach and share their pictures. This mod introduced an issue in the editor where the Underline button U went missing. To fix this issue, you have to edit the /js/ckeditor/config.js file on your server using FTP or cPanel (or its equivalent). You will have to clear your browser cache for it to get the latest version of config.js. If you are using CDN or CloudFlare, you would have to also purge the cache on their server. Thanks to William for reporting this issue! Watch the video screencast demo on YouTube. Unfortunately, this mod requires editing existing ckeditor JS files as vB didn't make it developer-friendly to easily add ckeditor plugins without hacking the JS. This means, you have to edit the JS files every time you upgrade. I'm thinking of making something that would easily update the files without manually editing them by hand. I will release it soon. No specific date though. Sorry not yet. I will prioritize to have it this week. Apologies for the delay. FYI. I have installed this drag and drop image upload mod on this site. Please try and let me know if it works for you or not. If not, please provide steps to reproduce and the error message (if any) and the browser used. Once it's fully tested and working, then I will release the mod to the public. Thanks guys for testing and confirming it works. Will release it soon! Yep the above shows that you can even drag images displayed on a webpage. That works even without this mod. Try it in vbulletin.com. It basically does "embed" (using [img] bbcode) and not "upload" the images. Oh I keep forgetting about that. I hate WYSIWYGs and always use 'standard' editors which makes you forget what WYSIWYGs can do. Let me try an actual attachment then.